Boyd Jensen received a Bachelor’s Degree from CSUS, with a major in Anthropology and a minor in Journalism. He earned a Master’s Degree from CSUS, majoring in Art, History and Theory. Boyd is currently retired, but worked for the Aerojet-General Corporation as a Photographer-Motion Analyst, taking high speed movies of rocket tests (1957-1969). He spent the majority of his career as a Graphic Artist/Photographer for KOVR-TV, Sacramento (1969-1987). Boyd has taught numerous photography courses to thousands of students at Sacramento City College, CSUS, and Cosumnes River College (1980-2001). Boyd Jensen’s artistic body of work over a 50 year career includes: “Begin With Love”, a slide show for the Church of Jesus Christ of Latter-day Saints, the first production from a stake of the Church to be distributed worldwide. “The Californias” for the California Department of Tourism; used throughout the world to increase tourism in California. “Sacramento Illustrated” a 24 projector slide show depicting the history of Sacramento; shown for three years in the Old Eagle Theater. Boyd produced multi-media productions for clients such as Sears Roebuck, Primary Children’s Hospital, Los Rios Community College District and the United Way. His Company, Jensen and Price, did the advertising for the Sacramento Kings for five years. Boyd and his late wife, Diane, were married for over 50 years and have 7 children and 34 grandchildren. Roger Robin Ekins received his Honors B.A. in English and a Master’s in creative writing from the University of Utah before completing his Ph.D. in Higher Education through The Union Graduate School. Ekins came to northern California in 1986 as Dean of Instruction at Butte College, in Oroville. There he also served as Director of the Honors Program and Faculty Advisor to the college’s honors society before retiring in 2008 as Faculty Emeritus. While at Butte College he also served as the President of the California Humanities Association. Previously, Roger both taught and served in administrative positions at the University of Maine at Augusta, the University of Redlands, and the College of Staten Island, City University of New York. Among his publications two are of particular interest to California history buffs. Defending Zion: George Q. Cannon and the California Mormon Newspaper Wars of 1856-1857 was published as volume 5 in the Kingdom in the West series by The Arthur H. Clark Company in 2002. Defending Zion was selected as that year’s “Best Documentary History” by the Mormon History Association. In July of 2016, Ekins published “William Brown Ide: Mormon President of the Republic of California” in the journal Mormon Historical Studies. He also wrote and helped produce a brief documentary video on Ide which can be found on YouTube. Roger resides in the town of Paradise, where he has served on the Editorial Board of The Paradise Post since 2001. He and his wife, Helen, are co-authors of the locally best-selling hiking guide, The Flumes and Trails of Paradise: Hiking through History on the Ridge. Roberta has always had a love for pioneer era stories. At family gatherings, when the children were sent out to play, she chose to stay inside and listen to the stories her great aunt would tell. Though history was never a favored subject in school, the view of history as a collection of stories became a strong motivation for learning more about her pioneer ancestors. Her mother instilled a love of genealogy through story-telling. And now history is the main focus of everything in which Roberta is involved. She loves to find new stories and shares them at every opportunity. In 1997, Roberta joined Daughters of Utah Pioneers whose objective is to teach an appreciation for pioneer contributions. She has served in her local camp and on the Sacramento Company Board in several offices including President. She is currently serving as northern California Regional Representative on the International DUP Board. She also serves locally as the Sloughhouse Pioneer Cemetery Co-Chairman. The cemetery is the oldest pioneer cemetery in northern California and is the final resting place of some of the original settlers of Sacramento County. DUP has owned the cemetery for over 40 years when it was deeded by descendants of the Rhoads family. For the past four years, Roberta has been involved in the maintenance and upkeep of the cemetery; the restoration of over 40 tombstones; and overseeing the many Eagle Scout projects that help in the restoration process. She drew a map to identify tombstone locations and wrote the biographical sketches used during cemetery tours. Roberta also teaches local California pioneer history as part of a living history program sponsored by the Elk Grove Historical Society. Since 2008, she has been a docent at the Rhoads School House located in Elk Grove Park just south of Sacramento. By appointment, third grade students spend a day at the one-room school living and learning as if it were 1894 with Roberta as the school marm. 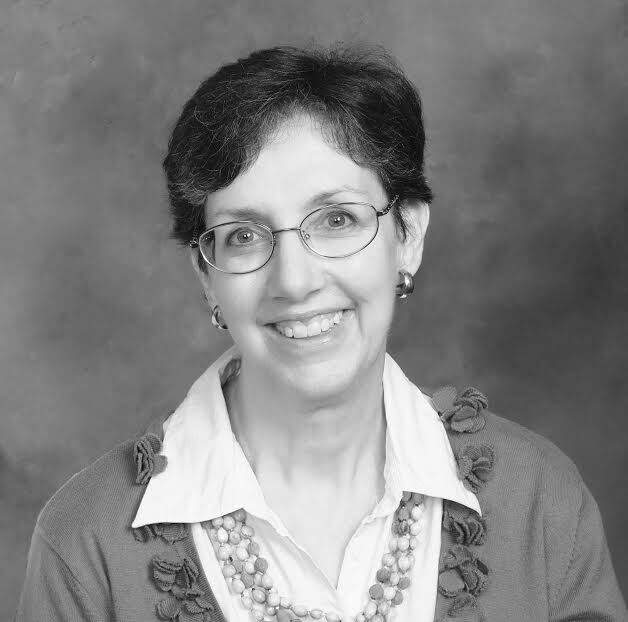 Recently, Roberta was appointed Director of the School and is on the board of the Elk Grove Historical Society. Several years ago, the California Pioneer Heritage Foundation produced a movie called “More Precious Than Gold” about the contributions the Mormon Battalion made to the settlement of California. Roberta was one of the contributing authors of the companion workbook which 4th grade students use as they study California history. Outside of DUP, she has 6 amazing children, 9 adorable grandchildren and a wonderful husband who supports her in all her hobbies. She and her husband met at the University of Utah where she graduated from the College of Business in Accounting. With a undergrad degree in Psychology and a Master’s Degree in Real Estate Development, Russ has had an interesting career in an almost related field of marketing. As CEO of the marketing company, Bedrock Markets, Inc., Mr. Thayne has led his marketing staff in serving the heating and air conditioning businesses throughout the lower 48 states for the past 16 years. Russ has served in Boy Scouts as a Scoutmaster, Troop Committee Chairman, Assistant District Commissioner and now serves on the Board of Directors for the Golden Empire Council. He has also served in many church callings, mostly with youth – including Scouts, young men, bishop and as a counselor in the stake presidency. He and his wife are parents of 5 children, and 7 grandchildren… so far. Larry F. Brasher was born in Salt Lake City, Utah. Following high school he served a mission in Finland. He received a BA in business management from the University of Utah in 1972 and a Juris Doctor from the same university in 1975. Beginning in the 4th grade and throughout his school years Larry studied Russian. While attending college he served in the 142nd Military Intelligence Linguist Company of the Utah National Guard. In 1970 Larry married Anne Hansen in the Salt Lake Temple. They have seven children and e 18 grandchildren From 2003-2005 Anne and Larry served a mission together in Kiev, Ukraine and Vladivostok, Russia, where Larry also served as the district president. While in school Larry began working for the Salt Lake Auto Auction, a family business started by his father in 1949. Following law school he decided to continue in the auto auction business. In 1978, they acquired the Sacramento Auto Auction. Larry and Anne relocated to California. Subsequently the family acquired four more auto auctions in Eugene, Oregon; Portland, Oregon; Reno, Nevada; and Boise, Idaho. Larry served as CEO of the parent organization, West Coast Auto Auctions until 2003. He continues to serve on the Board of Directors. He is also a past president of the National Auto Auction Association. Larry serves on the Board of Directors of the California Pioneer History Foundation and the Sacramento Chapter of the Freedoms Foundation of Valley Forge.